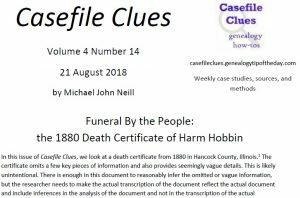 Casefile Clues is my how-to newsletter that focuses on records analysis, research methods, and process. Sources–Some weeks Casefile Clues focuses on a specific source or type of record, discussing how that source can be accessed, researched, and interpreted. Methodology–Some weeks Casefile Clues works on one of Michael’s problems. Many times these problems are “in progress,” and Casefile Clues reflects that by explaining what was researched, why it was researched, and where to go next (and why). Case Studies–Some weeks Casefile Clues focuses on a specific record on a specific person and analyzes that record, discusses what it says (and what it does not) and where to go next based upon that person and the specific record. Citations–Casefile Clues includes citations of sources and records. Articles can easily be read without them, but we include citations for those who prefer to have them and we do try and model citations in the style of Evidence Explained. Readable–We work very hard to make Casefile Clues readable. Columns are not “fluff” or generic “how-to” pieces. This entry was posted in Uncategorized on October 8, 2018 by mjnrootdig.